Jay Scott, sporting a brown ponytail and a shirt that exposes his tattoos, walks through Habatat Galleries in West Palm Beach, past Dale Chihuly’s fluorescent, coral-like cylinders and William Morris’ display of ancient tools. The 39-year-old weaves among pieces created by some of the world’s most renowned glass artists and then stops at the back of the store. Then he picks up a spiky blue alien sculpture. His partner Lindsey, who inherited the gallery from her retired parents in 2009, flashes a coy smile as Jay twirls the $20,000 piece, revealing its bright colors and elaborate workmanship. But this one is different. It’s “functional,” Jay says. In other words, it’s a bong. 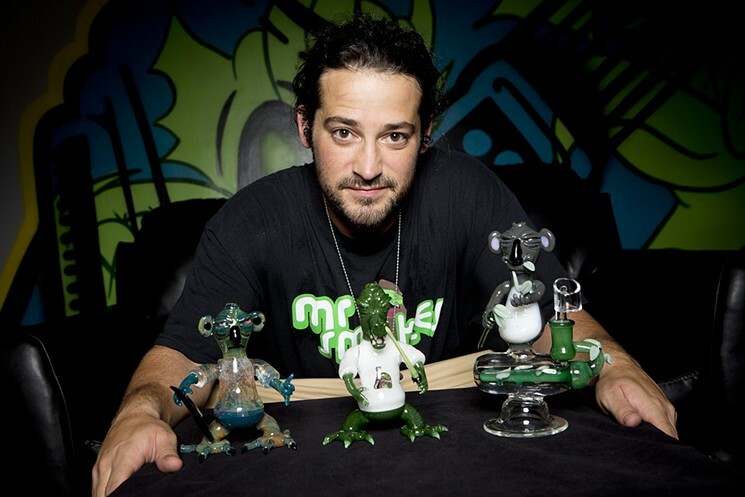 And Scott is far from the only South Florida glassblower making a killing in the luxury bong market. Previous ArticleDoes Your Weed Make the Grade?